Atlanta Mats Zuccarello scored in a shootout, Brian Boyle's goal forced overtime with 5:19 left in regulation, and the New York Rangers rallied to beat the Atlanta Thrashers 3-2 on Saturday night. Henrik Lundqvist stopped 20 shots through overtime and then was perfect in four shootout rounds for the Rangers, who avoided losing for the fourth time in five games over seven days. Wojtek Wolski added a second-period goal for New York. Anthony Stewart and Nik Antropov had goals for the fading Thrashers, who have lost six of seven. Stewart's 12th goal gave the Thrashers a 2-1 lead 18:01 into the second period. Bryan Little's shot from the right circle glanced off Stewart's backside, but Stewart gained control of the puck and scored to Lundqvist's glove side. Atlanta made it 1-0 on Antropov's tip-in -- his eighth goal -- 6:47 into the first. Wolski scored his ninth goal to lift the Rangers into a 1-1 tie at 2:43 of the second period. He was skating toward the bottom of the slot when Derek Stepan sent a pass to him from the right circle. The Thrashers seemed to get a boost from a penalty-killing unit that started the night ranked next to last in the NHL. Atlanta wasn't short-handed until 14:33 remained in regulation, but Ondrej Pavelec stopped three shots while the Thrashers were down two men. Boyle set up his 17th goal, tied for the most on the Rangers, with a hit on defenceman Johnny Oduya that forced a turnover. Boyle slid the puck past Thrashers defenceman Dustin Byfuglien, as both players skated past the Atlanta blue line, before regaining it and beating Pavelec. 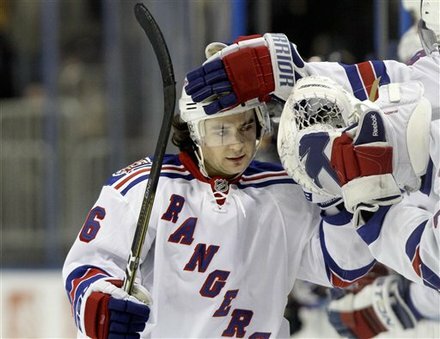 The injury-ravaged Rangers had six rookies in the lineup, including Brodie Dupont, who made his NHL debut. New York coach John Tortorella gave only seven shifts to Dupont, the team's third-round draft pick in 2005. He is the eighth rookie to make his Rangers debut this season. New York, which lost forwards Brandon Dubinsky and Ruslan Fedotenko this week to injuries, also saw defenceman Dan Girardi get banged up. Girardi had a bloody upper lip and nose after he fought Andrew Ladd in the second period. Notes: Wolski has three goals and six points in six games since the Rangers acquired him from Phoenix on Jan. 10 for defenceman Michal Rozsival. ... New York captain Chris Drury has no goals in 19 games since returning from a broken finger. 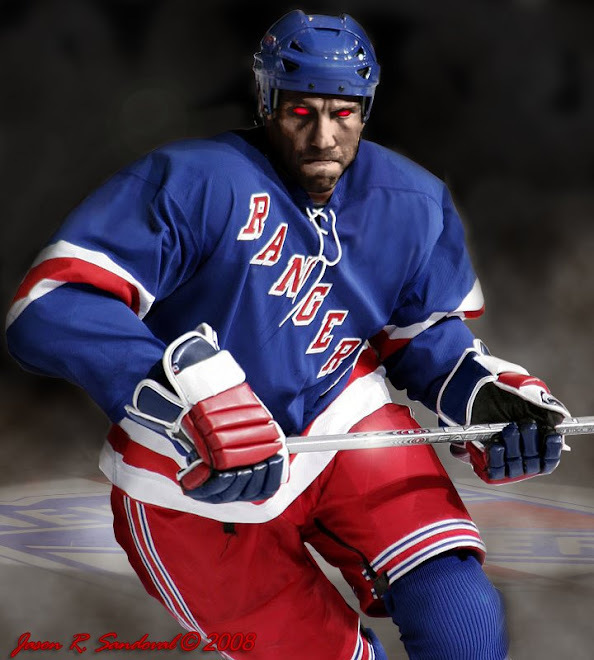 ... Girardi was trying to avenge a clean hit on defence partner Marc Staal when he grabbed Ladd's jersey and fought the forward.